Fluorescence spectroscopy is a widespread and powerful technique that can be applied to studies on large biomolecules and their interactions. In particular techniques using the modality of fluorescence resonance energy transfer (FRET) combined with encoded nanocrystal fluorescent microbeads are now being explored as a potential means of developing early diagnostic devices/systems formedical applications. A schematic of an example application utilizing fluorescence spectroscopy with a micro-bead assay is illustrated in figure 1 below. 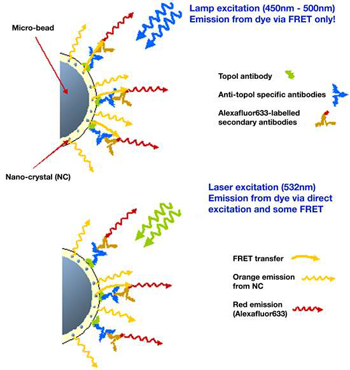 This experiment sets out to demonstrate how nanocrystals combined with FRET spectroscopy, could act as a detector for the presence of auto-antibodies. Auto-antibodies can act as markers of diseases developing in healthy individuals. This example [from ref. 1] looks at the human antibody, topoisomerase or Topo I (shown as green molecule in figure 1).The test is to detect the presence of anti-Topo I antibodies (blue molecules in the figure). Samples are prepared such that the Topo I antibody molecules (green) are attached to the microbeads in proximity to the nanocrystals.When these are incubated with anti-Topo I antibodies (blue), the latter attach themselves to the Topo I molecules. By further incubation with a solution containing dye labeled (Alexafluor633) secondary antibodies (brown), further binding occurs, as illustrated in the figure, which facilitates a FRET path between the donor excited nanocrystals and the receptor dye molecules. When illuminated with the broadband lamp (450nm-500nm), the emission from the dye molecules (red) is mediated via FRET due to close proximity from the binding; if the anti-Topo I antibodies are absent no binding will occur and there will be no emission from the dye molecules attached to the secondary antibodies which will move freely in the solution.The presence of the latter can be confirmed by direct excitation with the laser source at 532nm. In-depth details on this proof-of-principle technique, as demonstrated by Alyona Sukhanova et.al. can be found in reference 1. 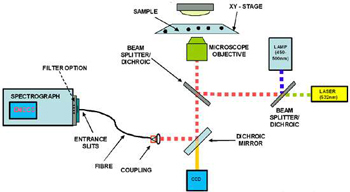 A typical setup is illustrated in figure 2 below, showing the main components of a spectrograph, high sensitive detector, microscope with adjustable x-y sample stage, a selection of excitation sources and a means of coupling the light from the output of the microscope into the spectrograph ( in this case via a fibre). Other configurations include a scanning confocal microscope setup and coupling of the light signal, after the confocal aperture, into a fibre for delivery to the spectrograph, whilst others configurations use direct coupling of the light via relay optics from the exit port of the microscope to the entrance slits of the spectrograph.